What Does a 90-Day Treatment Program Include? Why Attend a 3-Month Program? Longer stays in drug and alcohol rehab programs have been associated with longer-lasting sobriety, higher rates of employment and less criminal activity. The treatment process for these programs includes intake and evaluation, detox, therapy, self-help groups and aftercare. Longer treatment programs are a good choice if you’ve relapsed, if you have a long-standing addiction or if you feel that you need more time to practice your recovery skills in a sober environment. Cost is a big concern with 90-day programs. Several insurance and financing options are available to help cover the price. Many insurers will pay for detoxification, but they may not pay for other kinds of treatment. Rehab and recovery treatment programs have different lengths. In addition, every person is different, and every person will have different recovery needs. However, people often find the most recovery benefit from longer periods in treatment. If you’re able to attend a 90-day rehab program, your treatment outlook could improve substantially. These programs give you time to detox, to work with addiction treatment professionals on issues surrounding your drug use and to practice living a life without substances. You will meet with a professional to discuss treatment options and determine what approach will work best for you. If you have a dual diagnosis or co-occurring disorder (such as substance dependency and depression), you will discuss further treatment options, as treating multiple diagnoses requires extra care. Detox is a period of time where your body is eliminating all the substances in your system. Withdrawal from substances can be uncomfortable and sometime dangerous, so medical supervision is important. Remember: Detox is not the same as treatment. Cognitive behavioral therapy – You will take an in-depth look at your substance use and practice behavioral changes that will help prevent relapse. Motivational interviewing – You will develop internal motivations to quit using as well as take personal responsibility for your life choices. Contingency management – You will earn rewards for meeting treatment goals and lose rewards for breaking sobriety. Multidimensional family therapy – This type of therapy is mainly used for the treatment of adolescent substance abuse. It involves the family in the treatment process to improve family communication and improve the adolescent’s decision-making skills. Self-help groups such as Alcoholics Anonymous provide a supportive community of peers, where everyone is going through a similar struggle. Though many self-help groups are part of formal treatment programs, you are encouraged to attend these groups beyond completion of the program. The best substance abuse treatment programs offer some sort of aftercare once you have completed formal treatment. Aftercare can include therapy (both individual and group), counseling, sobriety monitoring (urine tests, etc. ), and self-help groups. More time to get used to a life without drugs. Spending a longer time in drug and alcohol rehabilitation allows you to hone your relapse prevention skills and better prepare for future temptations. Good for people who have a severe and long-term addiction. The more time you can fully commit to working toward recovery, the better your chances are of maintaining sobriety. Cost may be one of your main considerations when looking for a 3-month recovery program. Type of facility you choose. Kind of insurance you have. Whether or not you qualify for special programs or financing. Under the Affordable Care Act, all government-sponsored health insurance plans must cover substance abuse treatment, and the coverage will vary by state. If you qualify, you can also choose a public rehab facility that offers services at little or no cost. Private alcohol rehab programs, in contrast, may cost tens of thousands of dollars. But these costs may be offset by your insurance. Many insurers will pay for the cost of detoxification, but they may require you to pay for other types of treatment. You can also look into financing options. Location. If you want to fully escape your home environment, select a program that is farther away from where you live. If you have home obligations or a close support network, you may want to enroll in a program closer to home. Qualifications of the staff. Working with an experienced staff can make a big difference in your recovery. Staff certification represents a counselor’s level of qualification in substance abuse treatment. Certification varies from state to state; to find out what your state requires, visit the Addiction Technology Transfer Center Network. Treatment philosophy and types of treatment (evidence-based, 12-step, holistic). Recovery programs will offer different types of treatment based on their own recovery philosophies. Some may advocate a harm-reduction approach, while others may adhere to abstinence-based recovery. Additionally, many programs will offer medication-assisted treatment or medication-assisted recovery services. Family involvement. Some programs require family involvement in the recovery process, which some people find addresses a number of issues that pertain to their substance use. If this is something that you don’t want, however, be sure to find a program that does not have this requirement. Aftercare. The best rehab programs for alcohol or drugs will offer aftercare following completion of formal treatment. Before enrolling in a program, find out if they provide aftercare services. Participation in ongoing care can give you support when you leave treatment and help prevent relapse. 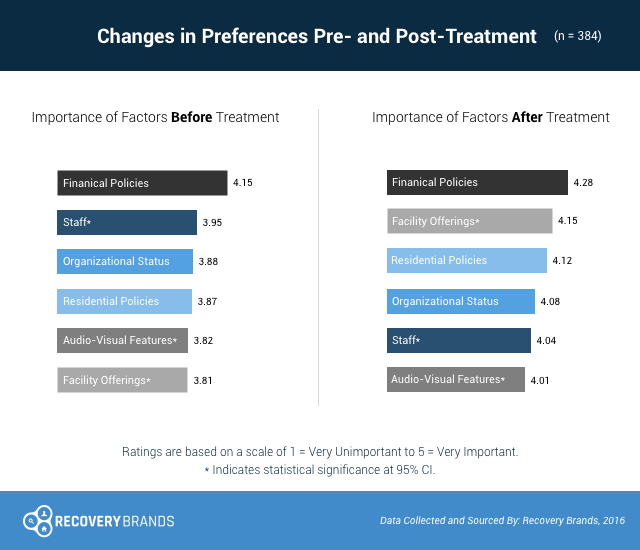 In 2016, Recovery Brands conducted a survey asking patients leaving a treatment program what they viewed as the most important things to consider when looking for treatment. They said the most important factor was the program’s financial policies, such as payment options, insurance accepted, and financial support. They also valued a facility’s offerings (amenities, food, recreational activities, etc.) significantly more compared to when they entered treatment. New patients may want to examine facilities’ financial policies and amenities to help them make a decision. If you’re ready to explore 90-day treatment recovery options for yourself or a loved one, contact a treatment hotline today. Be as honest as possible when you speak to the representative. In addition, you may find it helpful to think of some questions you’d like to ask about drug and alcohol rehabilitation programs. Kissin, W., McLeod, C., & McKay, J. (2003). The longitudinal relationship between self-help group attendance and course of recovery. Evaluation and Program Planning, 26. 311-323. Simpson, D.D., Joe, G.W., Rowan-Szal, G.A., & Greener, J.M. (1997). Drug abuse treatment process components that improve retention. Journal of Substance Abuse Treatment, 14 (6). 565-572. Condelli, W. S., & Hubbard, R. L. (1994). Relationship between time spent in treatment and client outcomes from therapeutic communities. Journal of Substance Abuse Treatment, 11 (1). 25-33. Simpson, D. D. (1981). Treatment for drug abuse. Follow-up outcomes and length of time spent. Archives of General Psychiatry, 38. 875-880. Sonesson, O., Arvidsson, H., & Tjus, T. (2013). Effectiveness of psychiatric inpatient care. Scandinavian Journal of Caring Sciences, 27. 319-326. Hubbard, R. L., Craddock, S. G., Flynn, P. M., Anderson, J., & Etheridge, R. M. (1997). Overview of 1-year follow-up outcomes in the drug abuse treatment outcome study (DATOS). Psychology of Addictive Behaviors, 11. 261-278. Etheridge, R. M., Craddock, S. G., Hubbard, R. L., & Rounds-Bryant, J. L. (1999). The relationship of counseling and self-help participation to patient outcomes in DATOS. Drug and Alcohol Dependence, 57. 99-112.